I’m excited to welcome Author Naomi Clarke on my blog. 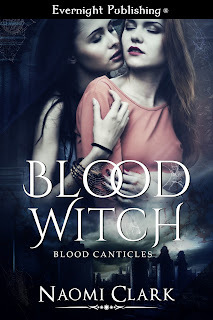 Naomi is here to share with us her latest release, Blood Witch. I don't often listen to music when I'm writing – mostly because I do a lot of my writing in my work place, and apparently a hospital food court is not the ideal location for blasting music in. But one thing I always do for my characters and books is set up a playlist on Spotify for songs that remind me of them. I listen to those lists on my commute to work, and it gets me in the right frame of mind for writing. A particular lyric will trigger something – a scene, an emotion, a bit of dialogue – that I just know will be perfect for a story. It's become an almost ritualistic part of my writing process. I'm actually still working on the playlist for Lola and BLOOD WITCH, but there are a few songs I've already picked out as being crucial for the mood of Lola's world. Want to check them out? Laura Marling – Devil's Resting Place – I love Laura Marling, but this song struck a particular chord, more for the mood it evokes than the song itself. It's dark and mysterious and hints at danger. Holly Golightly – Devil Do – It's not a spoiler to say that devils and demons play a part in BLOOD WITCH. For that reason alone, this song has earned a place on the playlist. AFI – Miss Murder – Look, if I ever leave AFI off a playlist, just assume I've been kidnapped by aliens and replaced by a pod person. I love AFI, and I never write a story without at least one of their songs in my mind. Miss Murder is the unofficial theme song for BLOOD WITCH. Blood Witch Blurb: Lola Guntram is used to being an outcast. She's the only blood witch in Fort Rosser, mistrusted by other witches and happier working solo. But when her dark practices make her the prime suspect in a brutal murder investigation, she's forced to turn to others for help. Not that she has many allies – her ex-girlfriend thinks Lola is the killer, and the local coven leader thinks Lola will corrupt them all if she gets too close.